The quality of feed depends the raw material, formulae and the process Adopted with the same level of raw materials and formulae the quality feed Mainly depends on Mixing process technology and the equipment performance. Materials should be added in correct order with larger materials added at first and small one added later. All materials should be added in the correct proportion and order, especially for the production of premix feed. When the formula is changed, the mixer should be thoroughly cleaned to avoid cross contamination. The transportation distance and height of materials after batching should be as short as possible and no conveying equipment like pneumatic device should be used as it would cause the separation of materials. 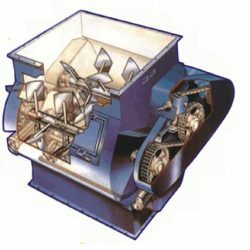 It has been realised that Toshniwal Mixer provides “High mixing accuracy combined with gentle mixing action, thus eliminating the over formulation of recipe and serving the best quality of the end product”.